We cleared the mountains and drove into Ouarzazate as the sun set. Our drive took ages long then we thought, with a mix of stopping for photos and waiting for congestion. Over dinner we pulled up the map and realized just how much further we had to drive the following day. Our already long drive was nothing compared to the 8+ hours ahead. Time to reassess. Clara jumped to, browsing google maps and booking.com seeing what was near by, cool, and available. She narrowed in on the perfect spot. 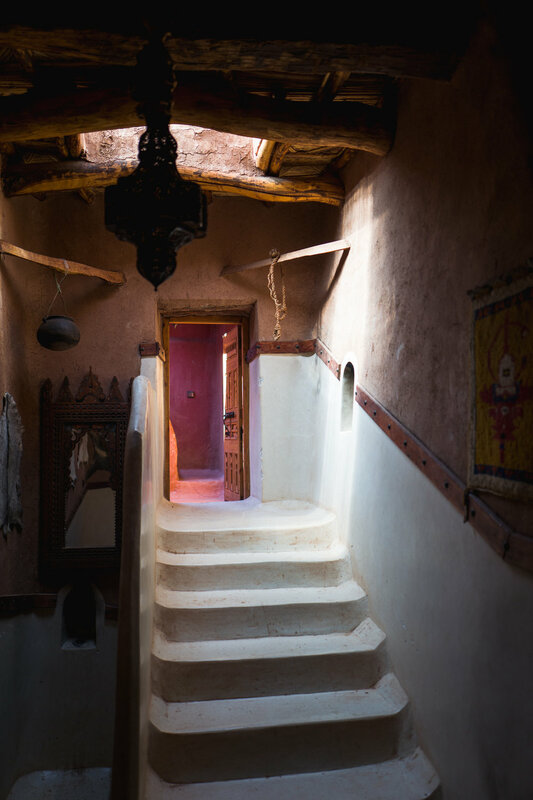 A 400 year old kasbah with no power, internet, or cell signal inside an UNESCO World Heritage site. We snagged a room, drove over, and were met at our car by our hosts. They grabbed our luggage and lead us by headlamp down the river, a few hops along sand bags in the river, and we were inside the walls of the ancient town of Ait Benhaddou. Inside Kasbah Tebi our hosts lead us by candle light to our room. We stayed up late with our host Mohammad for a cup of tea and chatted about his family's home, the kasbah we were staying in. In the morning we were greeted with an amazing breakfast of fresh cooked bread and homemade jams on the patio. Afterwards Mohammad took us on a tour of the town. Swinging by friends shops to check out art and rugs. Kasbah Tibi was probably the highlight of the trip. Staying in a totally off the grid hotel gave us the kind of decompression period we wanted, topped off by walking around an ancient city, we can't recommend staying here enough. Stopping off as we drove to explore is the whole point of road tripping in a foreign country. So looking at the drive ahead we opted to skip Fez and turn back for Marrakesh, leaving bonus time to explore as we drove. Which immediately paid off. 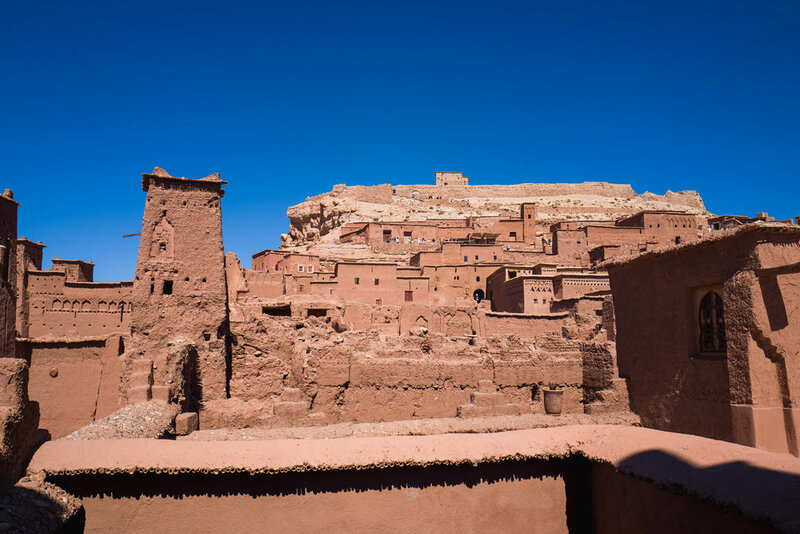 We stopped to check out the ruins of another kasbah and were intercepted by a local who was so excited to give us a walking tour of his hometown. Climbing around the old structure our impromptu guide gave us it's history with the little english he knew. We worked our way down to his garden in the oasis to try some food. Back on the road we stopped here and there making our way back to Marrakesh late at night.